So fans of this site (both of you) will be well familiar with my ongoing quest for the perfect Reuben sandwich, which has been thwarted at every turn by parvenu Brits and others who wouldn’t know a New York deli sandwich if it bit them. Well, the quest — for the moment — appears to be over, and we now have a front-runner in ReubenQuest 2012: Spilling the Beans Cafe on Clarence Street in the CBD. 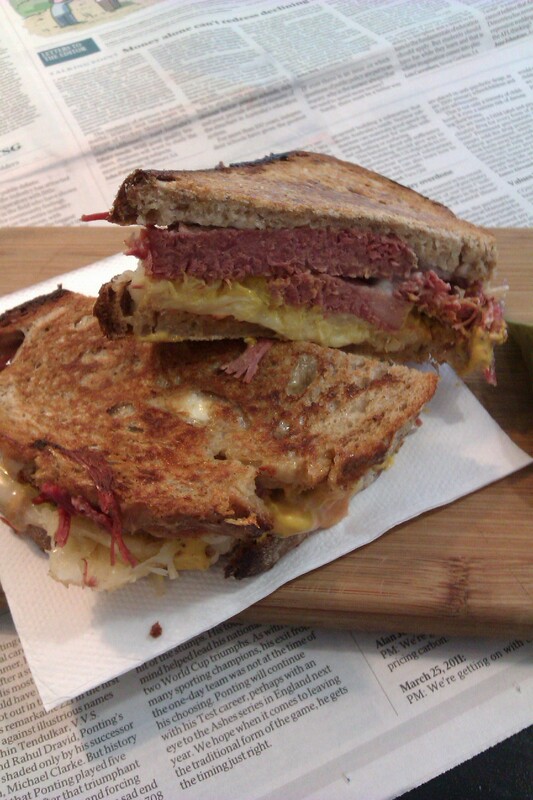 A proper Reuben. Thick slabs of corned beef (honestly, they could have been thinner, but they were oh-so-tender). Sauerkraut. Proper Russian dressing. Great rye bread. Not quite the Carnegie Deli, but pretty close. Well done. What’s your opinion on the Reuben from Martas, at Castle Cove? Do you think someone could actually improve on the NY Reuben, the same way that NYers improved on the pizza?